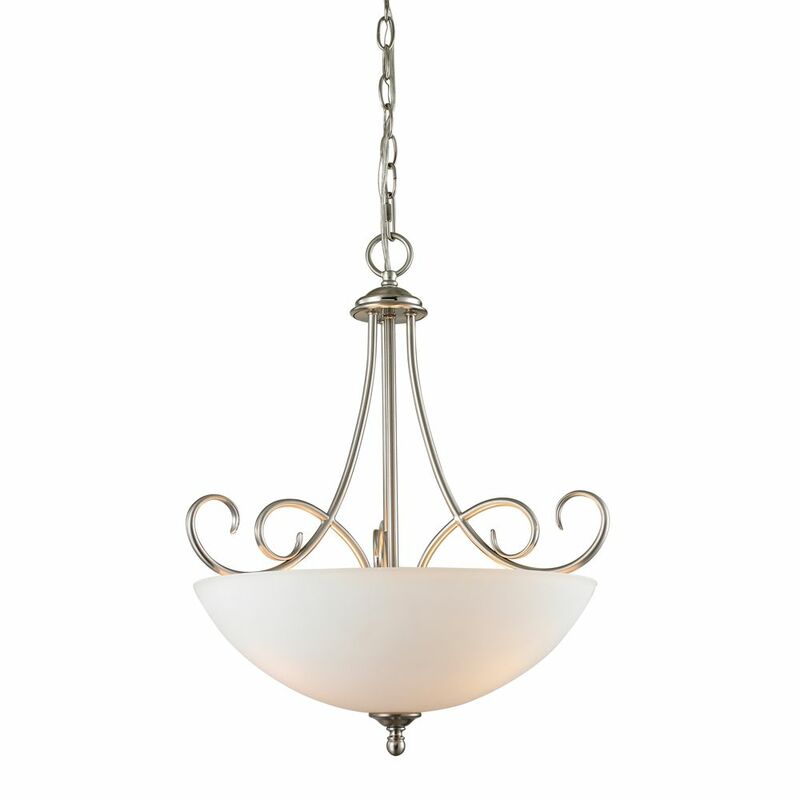 This elegant pendant light features a classic design with metalwork finished in brushed nickel and a beautiful white glass shade. Break away from the ordinary with Hampton Bays Four Light Pendant in Brushed Nickel. This stunning, extraordinary fixture will immerse your kitchen with brilliant radiance, enough for food preparation or any other task. Featuring an elegant brushed nickel finish complemented by charming frosted glass heads, this unique light is has adjustable height and heads to suit your lighting needs. Light spills out onto a streamlined shade in the Carbon pendant and mini-pendant. Etched white glass diffuser allows the light to illuminate the Graphite or Polished Nickel shade. Create a focal point with the Double Glass pendant collection's vintage-inspired silhouette. Oversized clear seeded outer glass with an inner etched white glass shade complements linear forms in a Graphite finish. Chrome LED version available with decorative diffuser is offered in a Brushed Nickel finish. 3 Light Pendant In Brushed Nickel This elegant pendant light features a classic design with metalwork finished in brushed nickel and a beautiful white glass shade.